I found this picture online, listed as The Healing Hole. It is unique and beautiful but not what I was envisioning. If you have been there and can confirm if this is or isn't an accurate photo, please email me, thank you! 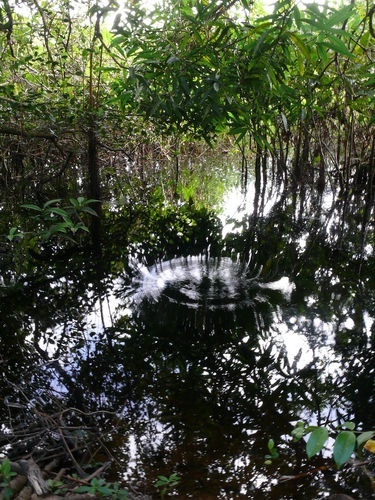 The Northern part of North Bimini Island is full of mangrove creeks. Hidden away amongst these is the Healing Hole. The Healing Hole is a pool connected to an underground maze of twisty little passages - I couldn't say whether or not they are all alike. The interaction between this underground tunnel formation and the sea tides results in the pool at the top being filled with mineral rich fresh water. The water in the pool has been said to have curing and restorative properties. Some say that there is a magical element to this power, others simply that the minerals themselves are beneficial to some people. Many tourists and other visitors have reported a general sense of well-being after a trip to the Healing Hole. On East Bimini, the Healing Hole's sulfuric waters are said to be beneficial for aching joints, rheumatism and gout. Those willing to traverse 35 yards of mangrove swamp and brave the cold water temperature to find out can judge for themselves. If you have visited The Healing Hole in North Bimini for your own respective health/healing needs, please email me your story to share on Spinal Trap. Please include any photos and/or videos for posting that you wish to share, thank you.